This page is about the modern-day state. For the former princely state, see Kashmir and Jammu. Kashmir. 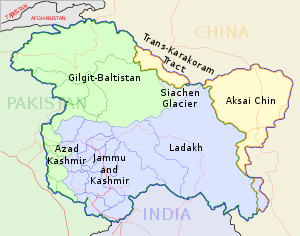 Jammu and Kashmir is shown in blue; Pakistan-controlled Kashmir is shown in green, China controlled Kashmir is Yellow. The White spot on the map is the Siachen Glacier. It is controlled by India. Jammu and Kashmir or Indian administered Kashmir (Ladakhi: ཇ་མུ་དང་ཀ་ཤི་མིར།, Urdu: مقبوضہ جموں اور کشمیر) is the northernmost state of India. When people talk about this state, they sometimes call it Indian-administered Kashmir. The state covers 39,179 square miles (101,473.1 km2) and is mostly in the Himalayan mountains. In terms of land area it is bigger than the Kingdom of Bhutan but smaller than Switzerland. Jammu and Kashmir used be a British protectorate in 1860. Jammu and Kashmir shares an international border with the states of Himachal Pradesh and Doab in Republic of India to the south and with the People's Republic of China to the north and east and the Pakistani administered territories of Azad Jammu and Kashmir and Gilgit-Baltistan, to the west and northwest respectively. There is a dispute over the territory of Jammu and Kashmir. Jammu and Kashmir consists of three divisions: Jammu region, the Kashmir Valley and Ladakh. Srinagar is the summer capital, and Jammu its winter capital. The Kashmir valley, often called paradise on Earth, is famous for its beautiful mountainous landscape. Jammu's numerous holy shrines attracts tens of thousands of Hindu and Muslim pilgrims every year. Ladakh, also known as "Little Tibet", is renowned for its remote mountain beauty and Buddhist culture. This page was last changed on 13 December 2014, at 03:26.